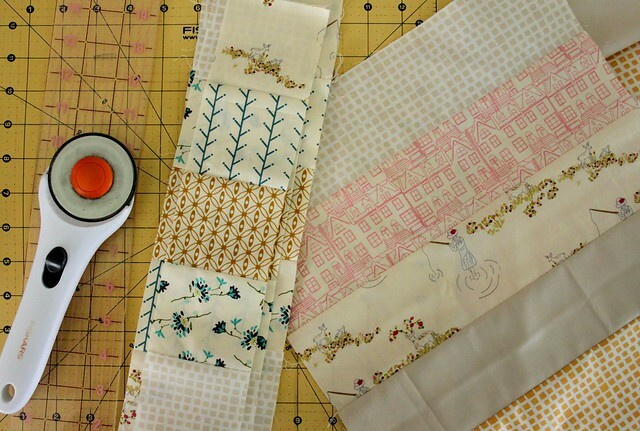 Yesterday, when I finally sat down to continue work on my Emmy Grace quilt in my Winter's Garden quilt pattern, I just couldn't commit to making that same exact pattern with these fabrics. Interesting changes kept coming to mind, distracting me and slowing down the usual speed that I work at. 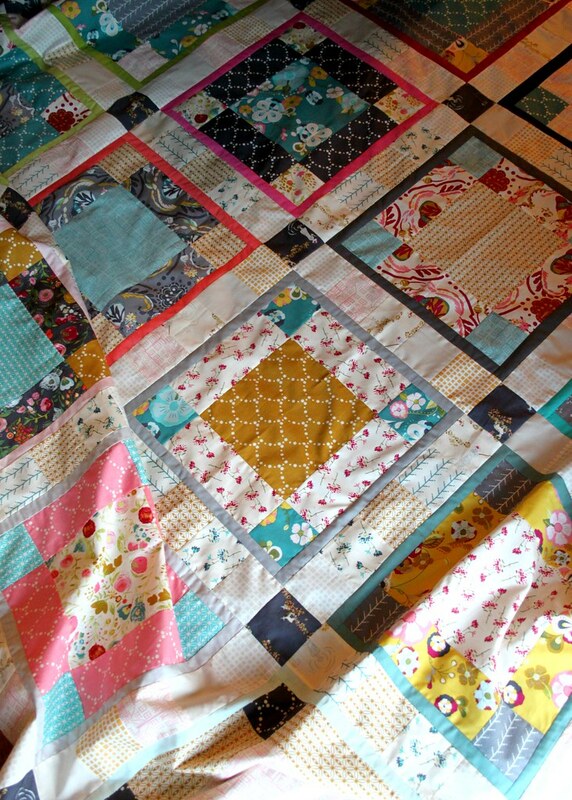 So, I ended up giving into just one idea, to patchwork my sashing with the Emmy Grace low volume prints. First by strip piecing! Then I cut my patchwork! After that I decided each of my finished blocks really should be framed with either the darker prints in this collection or maybe with coordinating solids. So, I pulled a stack of Pure Elements that would play nicely! I began by framing just one block, adding the sashing after, and just like that my new pattern emerged! Right away, I was so excited about where this was heading! I've been wanting to create something using low volume prints in this way for so long. This turned out to be the perfect opportunity and collection to use. After a good stretch of sewing time, my idea grew into a quilt top that I'm so happy with! Honestly, I really do work best this way. Having the freedom to change my mind, with my main focus being to simply create the best quilt I can with the fabrics I have to work with. I've never made the same quilt pattern twice, not sure why I thought I could do it this time! I love the stained glass look of sunlight through patchwork! You can find this gorgeous Emmy Grace collection available at Contemporary Cloth, Bobbie Lou's Fabric Factory, Llama Fabrics, Pink Castle Fabrics, The Intrepid Thread, Fat Quarter Shop, and Stash Fabrics! There is so much detail in this quilt! I am about to make my first ever quilt block today! Beautiful! After reading your original sneak peak of this quilt, I went ahead and ordered the whole Emmy Grace collection, I just love it so much! And this is a stunning quilt :) kudos! Maureen, this is truly the most beautiful quilt of yours I've seen...I mean that sincerely. 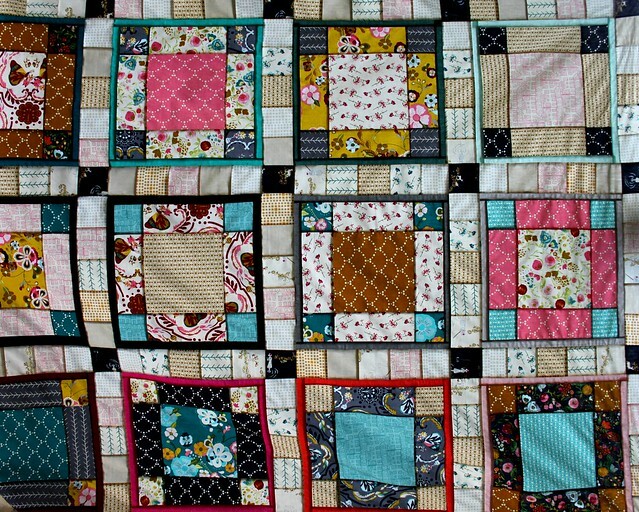 From the patchwork sashing, the Pure Elements solids framing the blocks...gorgeous! I've got to try this. Wow, it`s just fantastic and love how the low volumen highlight the central block! Maureen you hav Amazing talent. I salute you. God has blessed you. So appreciate you sharing with us and inspiring us. Thank you. What a fantastic quilt. I wish I had time to complete things like that. Hopefully some day soon. I would love to see some of your felting. Do you use dry needle or wet? You should have a box on the side of this blog of the winner each week. Just a suggestion. Wow! I love this quilt. You did a great job. The framing absolutely made this quilt for me. Excellent! I think this is going to be my next quilt. 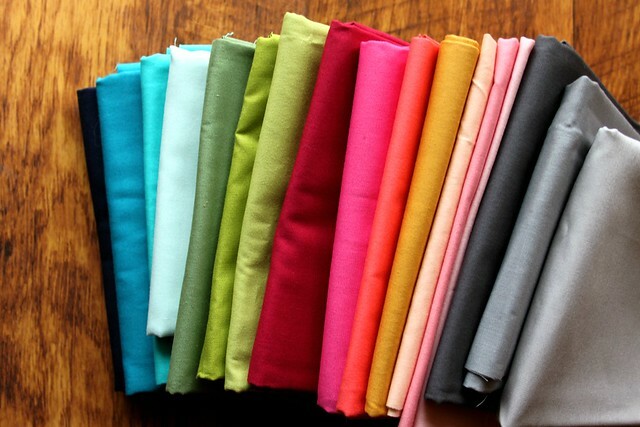 Maybe Ill use your fabrics! A question. I see that the low volume patchwork border fits exactly around your sashed squares. So did you add the colored sashings first and then calculate the patchwork border? 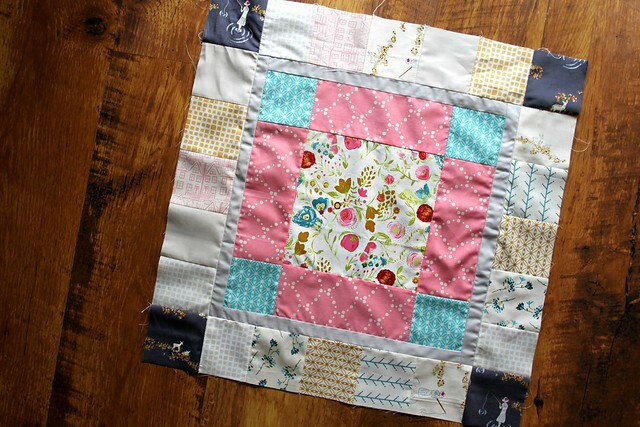 In your post you indicate that you made the patchwork border and THEN decided to add the sashing. So is it just a lucky coincidence that the border fit? Sorry, don't get the process here. Girl that is what pattern testers are for...making the quilts you don't want to remake! LOL Just remake a block or two for your pattern making and then leave it at that! This is my second most all-time favorite! Beautiful. My all-time favorite is the one with your self-portrait on it. I will always love that one best, because I watched it being created from start to finish. Especially the beginning of "what am I going to do with this?" Maureen, I love this quilt! Do you have a pattern written for it? I just made a quilt with a pattern called "Grandma Mary's Five Patch" (see Etsy) and it looks a lot like your Winter's Garden quilt. 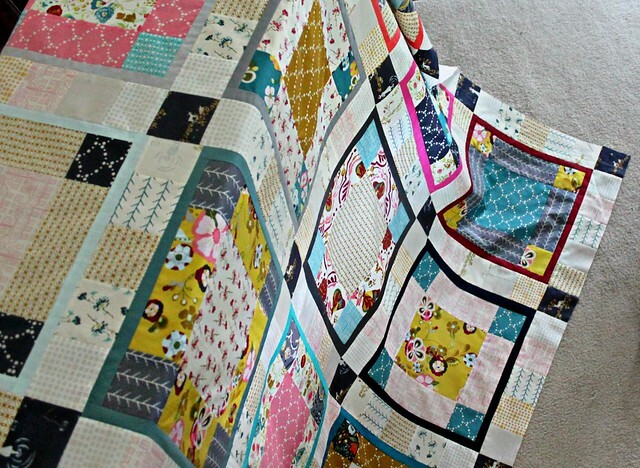 I like the changes that you made with this quilt, and I would love to make one like it with my Emmy Grace FQs. Do you have measurements on your finished blocks, and sashings? 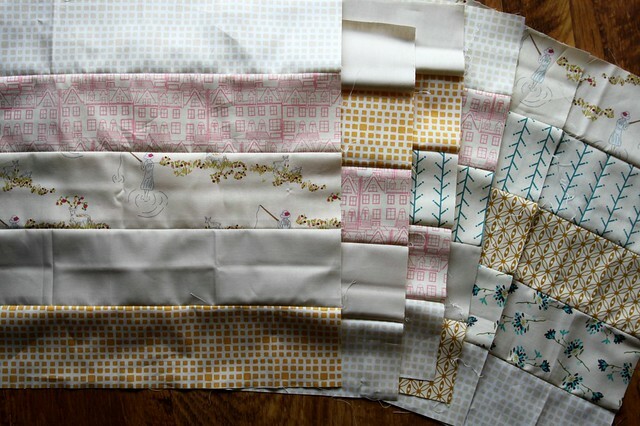 And, would a FQ bundle with some solids added in be enough to make this quilt? Thanks! Oh, here it is! I love it!!! Please tell me you're selling a pattern for it - I want it, pretty please!